ZMB6+ by Body Science BSc - Big Brands, Warehouse Prices! ZMB6+ By Body Science is a super ZMA product that will help normalise testosterone levels and help produce superior performance. Many men don’t realise the importance of zinc in their nutrition plan but this single nutrient is responsible for keeping your body functioning as it should. 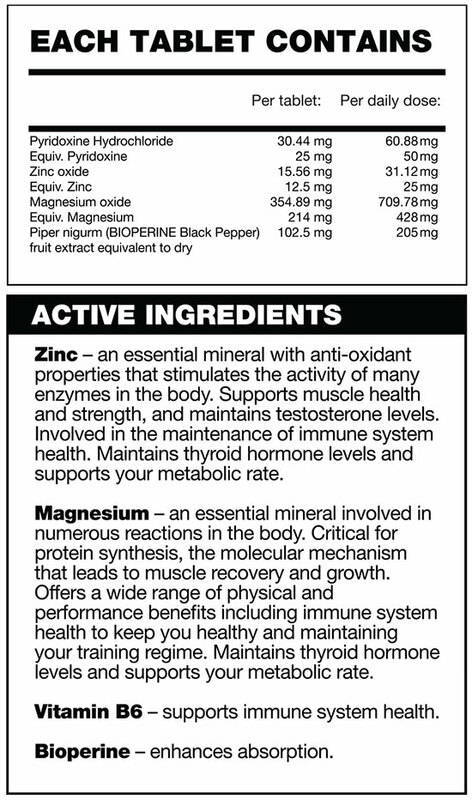 There is a direct correlation between how much zinc a man has in his body and how much circulating testosterone is present, so if you want to boost your testosterone levels, you’d best start by looking at your zinc intake. ZMB6+ By Body Science BSC will make achieving the right status easy. This product combines the perfect ratio’s of these three nutrients to help you do everything that’s needed. This product is all natural and contains three ingredients that you’d otherwise take in from your diet plan. But, most people are not taking in high enough concentrations of these three nutrients for them to be truly beneficial, which is why supplementation is a smart move. By using it, you can ensure you aren’t falling short in your diet and you’ll also get the right combination of dosages, which is also important for ensuring maximum success on this product. 205 mg of black BIOPERINE Black Pepper, which has been shown to help boost absorption rates in the body. So no matter what your goals happen to be, be sure that you get ZMB6+ By Body Science BSC on your side so that you can feel great and foster a better recovery.